Consultations can be scheduled online at any time, or by calling 0413 157 242 during business hours. To book online, please use the appointment form and we will email you confirmation of your appointment time and date. We send all patients a reminder by email the day before their consultation. If you need to cancel or reschedule your booking, please contact us as soon as possible. Consultations can be scheduled online at any time, or by calling 0481 135 766 during business hours. As this is a Private Practice, private fees do apply. Payment is required on the day via cash or EFT. For consultation costs please view our online appointment form or contact us. If you need to cancel or reschedule your booking, please contact us as soon as possible to avoid a cancellation fee. A cancellation fee will be charged unless 24 hours notice is given before your scheduled appointment time. Please note Medicare does not provide a rebate for the cost of your consultation. Patients are responsible for full payment of their account on the day. Private health rebates may apply according to your level of cover. 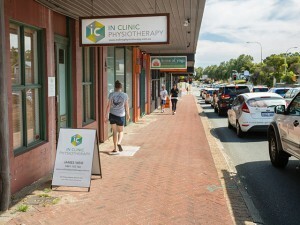 If you have private health insurance, please check with your Provider as you may be entitled to claim consultation fees back from them upon presentation of your In Clinic Physiotherapy receipt. Patients referred under the Department of Veteran Affairs are welcome. A full rebate is provided for eligible patients. Please note that Veterans will need to present a GP referral together with their DVA Card at the time of consultation. In Clinic Physiotherapy specialises in workers compensation cases. Please bring along all required paperwork and any relevant previous reports to your consultation.